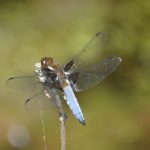 During a couple of visits to the Jubilee Wood pond in May 2018, five Odonata species were seen. 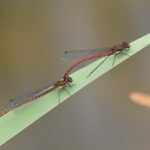 The first species normally to appear in the year is the Large Red Damselfly. The immature insects venture further afield but when they are mature they visit the pond to pair up and lay their eggs. 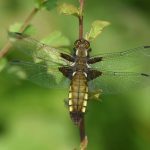 Another early species is the beautiful Broad-bodied Chaser. May is a good time to see them on sunny days as the blue males aggressively patrol their territories around the pond .The brown and yellow females are no less spectacular but spend a lot of time feeding away from the pond only appearing to mate and egg-lay. This species favour small ponds and do not seem to be in large numbers. 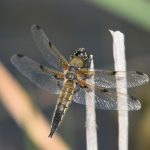 The Four-spotted Chaser however, can appear in large numbers and was very common at this pond in May. The males and females look the same as each other with four distinctive dark wing spots. 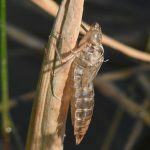 On vegetation around the pond exuvia could be found – this is the empty skin that is left behind when the adult dragonfly emerges after the larvae has climbed up a stem from the pond. 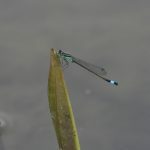 The other 2 species seen were the Azure Damselfly and the Blue-tailed Damselfly, both were very common here. As the Spring turns into the Summer there could be up to 17 species seen around this pond and woodland so plenty to look forward to in 2019.